The SYS-VMB1 is a live HD CCTV camera TV display system that displays video from multiple cameras on a single monitor. This system includes (2) high definition adjustable lens bullet cameras, a 4 channel HD CCTV video multiplexer, (2) 100 foot pre-made Siamese security camera cables, and a 5 foot HDMI cable. Customers typically supply their own TV monitor because any 1080p resolution HD TV with an HDMI video input will work (almost all modern TVs support 1080p resolution). This vari-focal bullet cameras included with this system are a favorite among companies than want to monitor a manufacturing process. We also supply a lot of these systems to retail stores. Want to use different cameras? 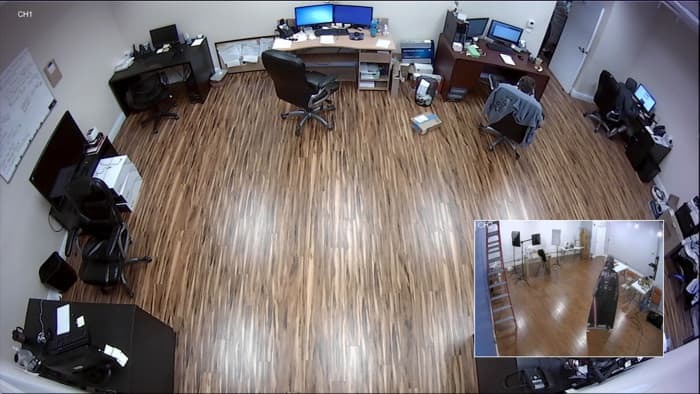 Customers can use the HD bullet cameras that are included with this system, upgrade to (2) 180 degree dome infrared cameras, or remove the included cameras from the system and choose from any of these 1080p HD security cameras that CCTV Camera Pros supplies. The HD-BL8 bullet style cameras have a 3.6 to 16mm vari-focal lens and no infrared LEDs. The adjustable lens allows the angle of view to be much more narrow and zoomed in. The optional dome cameras have a 180 degree fixed lens and built-in infrared / zero light capability. They domes provide an ultra wide angle of view. You can see sample photos that show the differences in the angles of view here. Setting our multi-camera live video display systems is simple. This is how it works. If you need to display your HD-over-Coax CCTV cameras on multiple monitors, please take a look at or HDMI over CAT6 Splitter Extender. In addition to support for up to 4 monitors, you can control the video multiplexer from each monitor location with the wireless remote control. This allows you to change to display between single camera and multiple camera views. The VM-HD4 quad HD CCTV multiplexer included with this system supports many different screen layouts that can be selected using the wireless remote control that is included or using the buttons on the front of the unit. Please note that we also have 8ch, 9ch and 16ch CCTV multiplexers available. 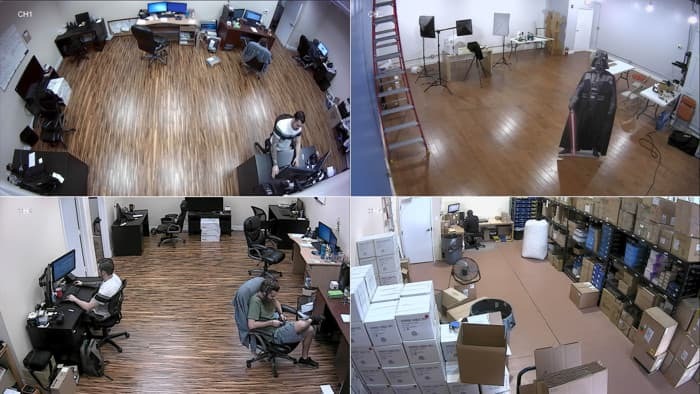 The above image shows 4 HD security cameras using the quad / 4 camera view of the VM-HD4. This alternative 4 camera view allows one large camera in the middle with the three small camera views along the right side. 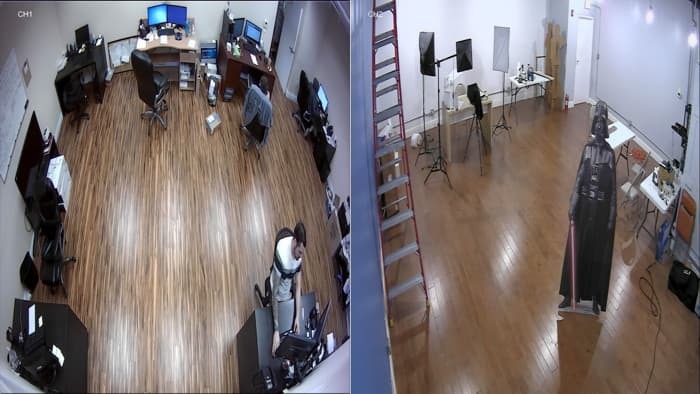 The above image shows the 2 camera view / side by side. 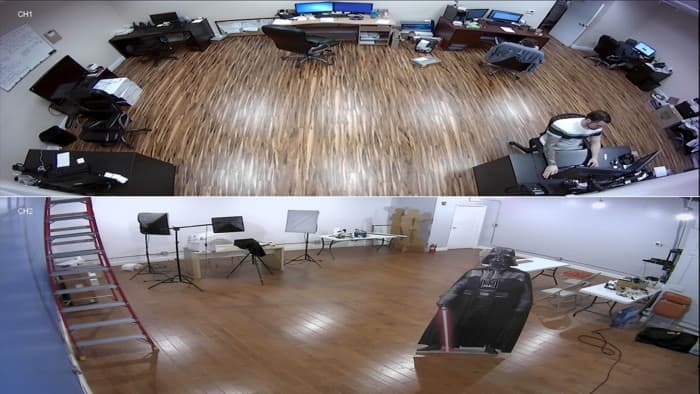 The above image shows the 2 camera split screen view. The camera views are horizontal. The above image shows a single camera / full-screen view using a 1080p HD-TVI security camera. The above image shows the picture-in-picture (PIP) view. 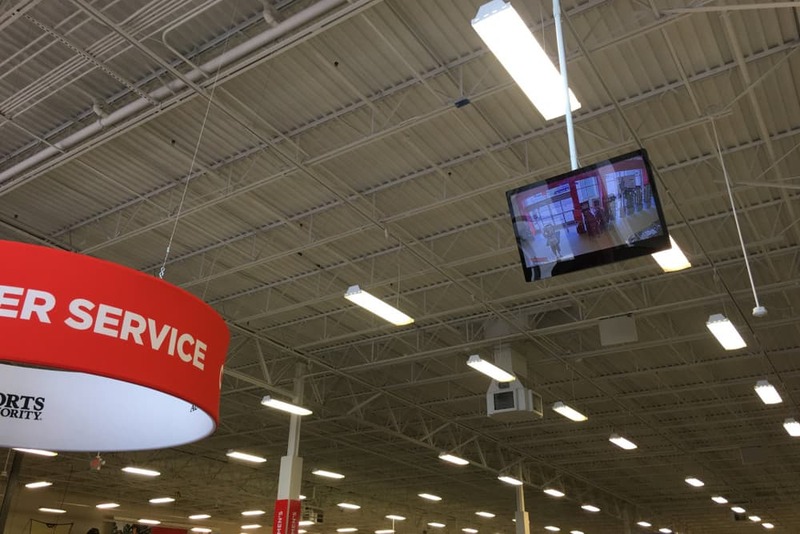 This is an example of a live camera display used at a retail store. This type of installation is very typically used by retail store chains. It creates a theft deterrence and helps customers feel safe knowing that the store uses a video surveillance system.